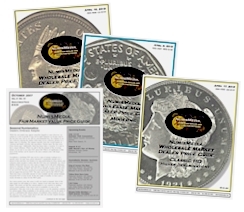 While many dealers are preparing for the upcoming ANA World’s Fair of Money in Rosemont, Illinois in early August, there is still plenty of trading activity in the current market. Even though most of the sales on the teletypes are for bullion related material, there are better date rarities changing hands on a regular basis. The most recent Legend Auction in Las Vegas exemplified this point. This may be a small boutique auction but the quality of most coins is superior for the grades. Total prices realized were just over $2.2 million. One of the many highlights of this sale was the 1844 Seated Dime in PCGS PR65 with the CAC sticker. This coin sold for $47,500 and is one of just two coins certified in this grade with none higher. There were also two original Proof Sets which included Half Cents through Seated dollars in various grades with some Cameos. The 1856 set brought $425,000 and the 1857 set realized $185,000. These are both once in a lifetime sets; for a breakdown of the specific coins included please contact Legend Numismatics. 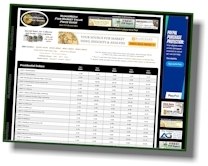 In this week’s HD Wholesale Market Dealer Price Guide advances were scattered throughout the charts. The most notable changes appear in the Seated Half Dollar chart where enthusiastic buyers are pushing prices higher. Not only are the better dates attracting buyers but even the common dates are selling as long as they have damage-free surfaces. 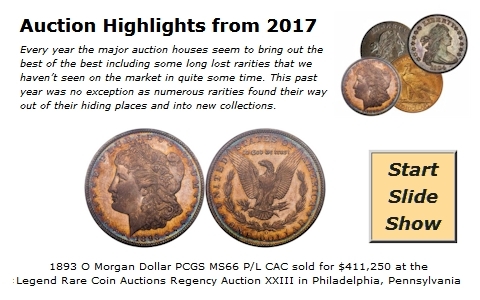 The 1841 Seated Half Dollar in MS64 jumped to $4,150 Market; this seemingly common date has only 11 coins certified in MS64 with just 5 higher in MS65. Another bright spot was the 1860 S in MS64 which increased to $5,950. This date has only 10 certified in this grade with none higher. This is a strong indication that the original mintage of 472,000 was mostly used in commerce and not saved in original condition. There are a couple of high value GSA Carson City Dollars on the rise this week as the 1880 CC and 1881 CC in MS67 both moved to higher levels. The 1880 CC is now at $29,000 Market and the 1880 CC is at $14,350. Remember these coins are in the original GSA black holder and certified by NGC. These high end coins are very popular and difficult to acquire. In the U.S. Gold charts, bullion is lower by $10 since the last HD issue, so there are numerous declines for the more common coins of each series. However, we have selected one coin as the highlight of the week: the 1929 $5 Indian is a very rare coin with about 500 coins certified in all grades by PCGS and NGC. The MS63 has 145 certified, the MS64 has 173, and the MS65 only 13. There are none higher. The MS63 increased this week to $46,250 Market and the MS64 and MS65 remained status quo. Locating the two higher grades is a difficult proposition. That leaves the MS63 as the most likely coin that collectors can acquire. In the last ten years the Market price for the MS63 has increased from $6,200 to the current $46,250. That is a $40,050 increase in this ten year span.